The Little House of Concrete Bookshelves: Donna Leon "Death in a Strange Country"
Having suggested Donna Leon has managed to land a fully formed character in the first Commissario Brunetti novel, it should come as no surprise to learn there's no hint of continuity from La Fenice to a Strange Country. Where other writers are still finding their feet with the new character and trying out different possibilities, Death in a Strange Country starts the way most Brunetti stories start, and proceeds gradually, step by step from there. That means, of course, that there's no need to actually read these stories in sequence, since the only long term key character yet to emerge is Signora Elettra and the only reason she hasn’t turned up yet is because she hasn’t been needed. In other words you could summarise the plot line with a semi-formulaic Brunetti is going about his ordinary day to day business when he’s called to a crime scene, the investigation meanders along and there’s an eventual resolution of some, though not necessarily all, of the issues raised in the course of the investigation. Expressed in those terms (and the same is more or less true of anything in the genre) there’s not really that much there, and the devil (or, in this case, the charm) is in the detail the author provides to put some flesh on the bare bones, and it’s here that the distinctions that account for differing tastes come in. James Lee Burke would people the narrative with a liberal helping of well-realised minor characters, a couple of truly impressive psycho and sociopaths and unearth the odd skeleton in several interlocking closets along the way, with frequent reminders of their own mortality and past failings for the key players. When you’re talking the detail, that, for mine, is the devil, but it will be played out across a prose landscape that’s immaculately realised in writing that goes close to shining. Andrea Camilleri will have Montalbano running across the Sicilian landscape, interacting with the regular cast and manipulating things to thwart the Commissioner’s efforts to hamstring him, and the whole thing will proceed at a lively clip with a definite raffish charm. 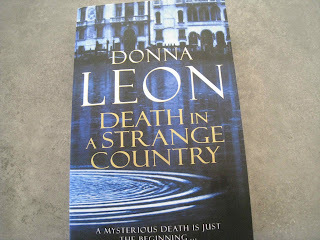 Donna Leon, on the other hand, with Venice as the backdrop and Brunetti as the ordinary family man thrown in to investigate matters that have more to them than meets the eye, moves things through a narrative that has its twists and turns and while we’re often talking serious matters the interaction of weighty issues and a decent human being are the key ingredient in a very well realised series. Death in a Strange Country starts with the body of a young man found floating in a Venetian canal.He’s been stabbed, and there’s nothing on the body to identify him, but there were some coins in his pocket, and a look at his teeth convinces the coroner the victim was American, which at least provides a starting point for the investigation. Given that identity and the fact that his wallet is missing it seems reasonable to assume the killing is a drug-related mugging, though a bit of preliminary checking reveals that the area where the body was found is relatively drug free (the garbage man has never complained of finding syringes on the street in the morning). As far as Brunetti’s superior, Vice-Questore Patta, is concerned, there’s a danger to the city’s tourist trade, so Brunetti had better be smart about finding a suitable culprit. Not necessarily the culprit, a culprit. To stop him from getting too involved with unnecessary detail Patta hands him the investigation into a burglary from a Grand Canal palazzo which has all the external appearances of an insurance job. A check around the city’s tourist accommodation fails to deliver any missing Americans, so Brunetti checks with a nearby military base. It’s not the sort of situation where the Italian police can just go barging in, but when the military authorities check around they find, yes, there’s a serviceman who’s gone missing and send in his superior officer to identify the body. Captain Peters (Doctor Peters if we’re not talking rank), the superior officer, as it turns out, is young, female, attractive and deeply distressed when she views the body, something that doesn’t quite tally with personal detachment and her status as a medical practitioner though, in her own words on the way to the cemetery island, it’s different when you know the person. The reaction, when the identification is made, runs a bit deeper than that. From there we’re teetering on the brink of spoiler territory, but the victim, Sgt. Michael Foster, apart from his designated position as public health inspector at the American military hospital wears another couple of hats. Brunetti’s visit to the base gives the author a free shot at some of the absurdities of a little America on foreign soil (Burger King, frozen pizza, Baskin Robbins and Ben & Jerry’s ice cream in the land of gelato). A return visit to the apartment reveals someone has checked the hiding place, and a couple of days later Doctor Peters’ death is reported in the Sunday paper, with an overdose as the cause of death and a strong suggestion of suicide. Since Doctor Peters had told Brunetti she’d spent six years in medical school followed by four years in the Army, and was six months off getting out (I shouldn’t even say I want to go back to my life. I want to start one) it’s fairly obvious (to Brunetti, at least) that someone is going to a great deal of trouble to cover up the reasons for the first murder, is determined to provide a ready-made solution to the crime and isn’t too particular about collateral damage. Put all that together, and you’ve got the ingredients for an intriguing mystery, and while most of the characters hit the pages fully formed in Death at La Fenice and are unchanged here, there’s an evolutionary step in Brunetti’s relationship with his aristocratic father-in-law. After twenty years of marriage, Brunetti’s still not comfortable in his father-in-law’s presence, but Count Falier definitely has his uses. When you need to find out gossip about a German opera conductor, for instance, a social gathering at the Palazzo Falieri provides an avenue to meet the sort of people who might know. Here, once the pieces have fallen into place and the deaths of Sergeant Foster and Doctor Peters have been explained, while it’s obvious nothing can be done through official channels a word in the right ear is enough to have the issue dealt with, though it’s fairly obvious no one is entirely happy about it. Still, there’s no doubting Brunetti’s father-in-law is an integral part of the whole plot resolution puzzle. With his contacts within, and knowledge of, the upper echelons of Italian society he can get Brunetti’s investigations into places that wouldn’t normally be accessible, and when Signora Elettra hits the ground running in the third title in the series everything’s in place, and since that’s the case, the changes in Brunetti’s relationship with the in-laws will, of course, be a narrative strand to watch as I work through the rest of the series in order.